Free expanding tubing does not require a constraint. The material becomes stable at an internal pressure and will hold its diameter with relative ease. 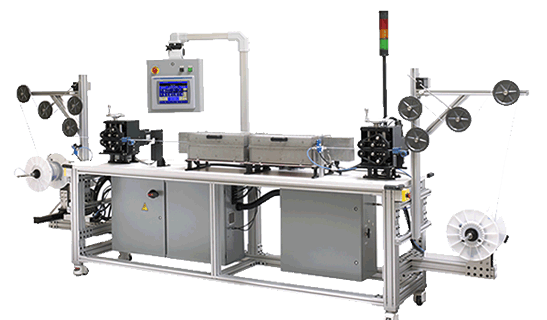 A laser mic is incorporated on the expanded end of the machine to provide feedback to the system control. Tube internal pressure will be adjusted as needed via an algorithm in the control to maintain the recipe diameter. The tube can be pressurized either on the supply side or the take-up side. This tubing is transported thru the machine via a couple caterpuller drive systems. The systems can be geared (draw ratio) to maintain a constant tension on the tubing. EBD heaters are used to circulate hot air around the tubing to obtain a uniform heat distribution. In some materials a pre-heater is incorporated to preheat the tubing prior to the main heater chamber. Dancers are used on either end of the machine to maintain adequate tension on the tubing for proper reel wrap and Caterpuller feed. The user interface is a 10″ touch screen display. The standard machine is capable of supporting 24″ diameter spools of tubing up to an expanded diameter of .50 inches. The machine complies with all NFPA ’79 and CE standards.